Why doesn't EdReady cost anything? What is a “Guest” account? What is the difference between the “public” version of EdReady and an “institutional” version of EdReady? Which Internet browsers are supported for EdReady? What are the (?) icons I see throughout the site? I’ve been studying & mastering topics, but the unit is still marked as “Not Ready” or “Needs Review”. Why? Is EdReady just a college readiness tool? 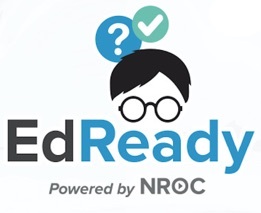 EdReady is a personalized learning platform: originally launched EdReady with a focus on college math readiness, it was expanded to include college English readiness in 2017. The math concepts covered by EdReady are often lumped together and called "Developmental Math," covering everything from basic Arithmetic, to Beginning and Intermediate Algebra, and special topics in Geometry, Statistics, and Trigonometry. These topical areas are usually covered in middle and high school, so many middle and high schools are using EdReady to personalize learning this material for the first time. Subsets of this material may also be needed for certain programs of study, such as through workforce development programs or for major tracks at a university, and EdReady can be used to personalize preparedness pathways for those programs. Our expectation is that the curricular coverage within EdReady will continue to expand, and that the diversity of different use-cases to which EdReady is applied will continue to grow. College readiness is certainly a key area of focus, but not the only one. How are the target scores determined?